Cool Down Your Garden with Blue Flowering Plants | Global Garden Friends, Inc. When the month of August brings hundred degree days, I am reminded why I use cool colors and well placed shade in my landscape designs. Take a drive around the neighborhood and look at the yards that draw you in. It’s usually the shady retreats with cool colored flowers that look comfortable – blues, whites, pinks and purples all sparkle. It makes sense that shady gardens with a tree overstory will be more comfortable on hot summer days. But this shade also attracts the eye as greens are deeper and cool colored flowers pop. This is the time of year where reds, oranges and yellows do not always look good. With bright sunlight, and soaring temperatures, those colors tend to become harsh. And variegated foliage, unless placed in deep shade, looks scorched. I do use a few hot colors in companion plantings such as black-eyed Susans. But plants with blue flowers are my favorite. Hearty Blue Plumbago – Brilliant blue flowers with striking red calyces cover bright green foliage from mid-summer to fall, when the leaves turn deep red. Mexican Petunia – Ruellia has metallic bluish foliage with scores of vibrant blue flowers that appear with the onslaught of hot summer weather. Can be invasive. Salvia ‘Black and Blue’ – Herbaceous perennial with cobalt-blue flower is held in a black calyx along the tall flower spikes above the lush green foliage. May need to be secured to plant stakes with plant clips. Hydrangea ‘Endless Summer’ – Flowers form on the current year’s growth as well as on old wood and can bloom for more than six month, especially if deadheaded. Azure Bush Germander – Tolerates poor soil and has gray-green leaves with silvery-white undersides that shimmer in the sunlight. Anise Hyssop – Hot weather intensifies the scent of this blue bloomer making it irresistible to bees and butterflies. Agapanthus ‘Midknight Blue’ – Has rounded heads of the deepest darkest blue flowers you can imagine. Bluebeard (Caryopteris) – Grows into a compact and flattering companion to other late bloomers such as asters and black-eyed Susans. Wishbone Flower ‘Midnight Blue’ – this tender perennial is a mint relative that likes partial shade. 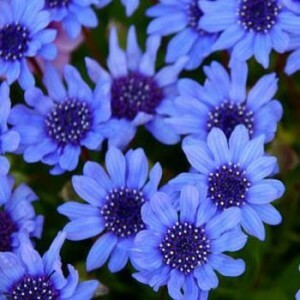 The Blues Blue Daisy – This annual has a profusion of gorgeous sky-blue flowers that rise above tidy, compact foliage. I am always looking for other proven performers. What are your favorite blue flowering plants?